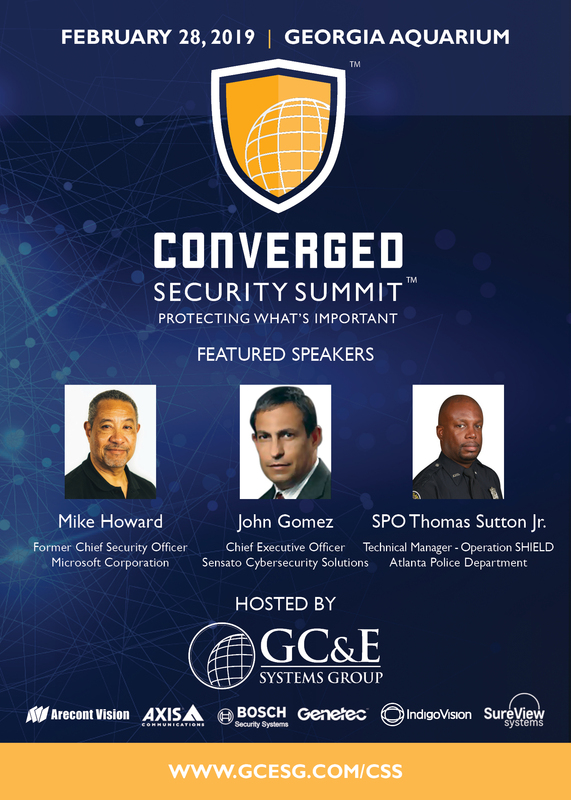 ATLANTA, GEORGIA - GC&E Systems Group, Inc. (GC&E) will host Atlanta's premier security event at the 3rd Annual Converged Security Summit (CSS) on February 28, 2019 at the Georgia Aquarium in Atlanta, Georgia from 8:00 a.m. to 3:00 p.m.
CSS 2019 focuses on the convergence of information, cyber, and physical security systems and the criticality of viewing them as an integrated platform to be protected from evolving vulnerabilities and risks. With the Internet of Things driving the connectivity and integration of an ever-growing number of devices to our networks; the proliferation of IP-based physical security devices such as cameras and access control systems; and the storage of access lists, policies, and procedures on our systems, avenues of attack aimed at a multitude of enterprise assets is expanding at an alarming rate. Reliance on technology alone is not enough to secure these assets, and corporate executives are finding that responsibility for cyber security compliance falls squarely on their shoulders. Viewing information, cyber, and physical security as separate organizational or operational entities almost guarantees an organization's inability to secure any of them. What must an organization do to protect its valuable data, systems, and people? CSS 2019 brings together three thought leaders within the cyber and physical security industries to provide their perspectives, insights, and recommendations regarding the best means to protect our organizational assets (information, intellectual and physical property, customers and employees). Additionally, more than 40 nationally-recognized, best-in-class security and information technology vendors will be in attendance to demonstrate and discuss their unique products and service offerings. CSS 2019 is the not-to-be-missed security event of 2019 providing practical information that can be applied to your business or operations immediately while providing the opportunity to network and speak first hand with industry-recognized, subject-matter experts, and best-in-class vendors. Mike Howard, Former Chief Security Officer at Microsoft Corporation, will discuss the digital transformation Microsoft has taken as a physical security organization by creating one of the best-in-class integrated Global Security Operations Centers (GSOCs) in the world to now transforming into a Virtual Security Operations Center (VSOC). He will elaborate the need for end-to-end security governance in an enterprise and will also touch on the leadership traits he believes will be integral for a security leader in today's and tomorrow's era of digital transformation. John Gomez, CEO at Sensato Cybersecurity Solutions, will engage the audience in a highly interactive and dynamic session of cybersecurity defenses, strategy, and operations. John will lead 2 teams through this table-top exercise of attacks and defenses in real-time so you can examine real-world attack methods employed by Russian cyber attackers. He will challenge you to become aware about your own assumptions and practices related to cyber and physical security. SPO Thomas Sutton Jr., Technical Manager of Integrated Video Support Unit at Atlanta Police Department, will elaborate what the APD Operation Shield is and how the nearly 11,000 cameras throughout metro Atlanta are integrated into the Video Integration Center (VIC) to help APD prevent and solve crimes. Additionally, he will share lessons learned in APD's CCTV preparation for Super Bowl LIII. There is no cost to attend and parking at the Georgia Aquarium is complimentary. Breakfast and Lunch are included. For more information and to register, visit www.gcesg.com/CSS or email at CSS@gcesg.com. Founded in 1999 and headquartered in Peachtree Corners, Georgia, GC&E Systems Group, Inc. is a Veteran Owned systems integrator providing diverse Internet Protocol (IP)-based electronic security, information assurance, Information Technology (IT), and telecommunications services and solutions.